The documentation for actually using the testable script locally in one’s project is very unclear. Do I put the CDN link in the head? Body? Does it matter? The documentation mentions building. If I was a newbie (which I’m not) I would have no idea what you were talking about. None the less, I am unable to get the tests to run locally. If someone has made as far as working on the projects, they would have already learned enough about where to put the CDN link. If the person went straight to the projects without learning the basics of HTML, then that is another issue. If someone is a moderator to help people and do some good work, they would know that obtuse and veiled commentary about a persons intelligence has no place in a public forum dedicated to learning and community. If that moderator made blanket assumptions about the path someone took to get there, that would be a simple case of shallow presumption and basic foolishness! The link listed on the Github page for the testable-projects-fcc was wrong. I got the tests to run in CodePen, but locally they still fail. I think you are reading far more into what I said than was intended. I have said nothing about your intelligence. I have no information to make a judgement about how smart you are. I do believe that if you would have completed most of the work before the projects begin, you would have a much better idea how to answer your own question. I will give you the answer to the question you first asked, which I should have done in the first reply. You can put the following pretty much anywhere in the page, but the best practice is to put it before the closing body tag (like shown below). Well, Randell you did imply that I didn’t go through the course material, did you not? As for the basics of HTML, you say correctly that doing the projects without a basic understanding would be another issue. Were you not implying something with that passive aggressive response? I will spare you veiled inferences and simply ask, please be careful in how you present your assumptions in the future. Just because someone does the entire Responsive Web Design curriculum in a few hours, doesn’t mean necessarily that they have no understanding of HTML. 10+ years in web design and CS degree have given me more than a “basic” understanding. I was originally commenting on the unclear documentation, because a friend of mine said they were having a hard time with the testing scripts. So it seems, perhaps, you may have read too much into my original post. Well, Randell you did imply that I didn’t go through the course material, did you not? And he was talking about that hypothetical newbie. He made the point that if someone has made it to the projects, they probably know about CDN links. Or they would at least know enough to know how to find out. Or they could ask the forum (a few have.) He was saying that that hypothetical newbie should know - he wasn’t insulting his intelligence. Or yours. Maybe it should be explained in the materials. Maybe it shouldn’t. That is a reasonable debate. But no one was insulting anyone. Should it be in the materials? My theory has always been that it’s a good think that FCC doesn’t explain every minute detail. It teaches people to be resourceful and go looking for answers, just like they’ll have to on the real job. And correct me if I’m wrong but don’t the instructions also have a link to a template project with the link set up already? @QuincyLarson, hi, where on Free Code Camp are the old legacy certificates available? I don’t see them! 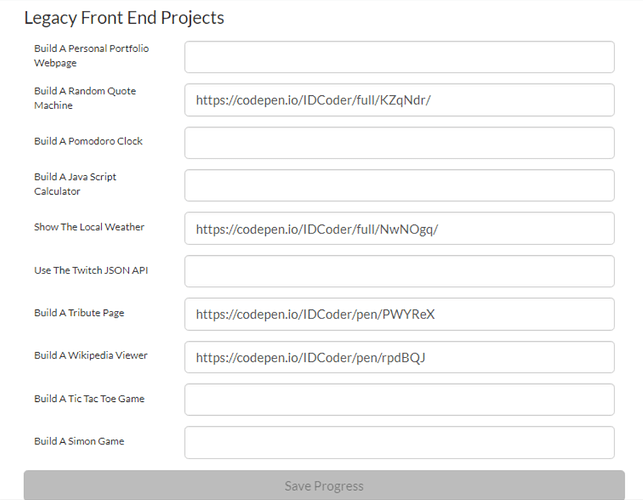 I’m roughly finish with most of the projects but haven’t submitted them all yet? When I’m ready to submit them to receive the old Front-End Development Certificate, where do I go? Thanks in advance for your help! Okay, I attached a screenshot image below. Do I have to just submit these projects (irregardless of if I have completed all the challenges) and I can get my legacy Front-End Development Certificate? Hi everyone, if I just want to learn Backend then I only need to start at Apis And Microservices Certification part? Many of the projects have moved to the interview prep section. We would hyperlink to them directly from the settings page, but due to the way we built it, this isn’t easy to do. We’re planning to update this once we take care of some more pressing issues first. Hi everyone, nice to find you guys with the amazing tutorials and courses, il be joining soon your supporter squad, im hyped up. Just completed the " Responsive Web Design Certification (300 hours)" full course and examinations , 1-2 days ago, i wanna go for a full stack certification course and examination to refresh my memory on some things learn more past the css level and js i been doing this past years. When does the certificate is awarded? i already sent the links to my codepends on the responsive design through the “Solution” input field , nothing happened till now. Is there a manual verification process delay? Edited: i found out the settings area which some campers where showing above, was able to claim it! was thinking they are automatically awarded since they are submitted. Anyway, happy to be here, and learn from you guys, i really love the courses, they are so well made, putting in practice is the way to learn. 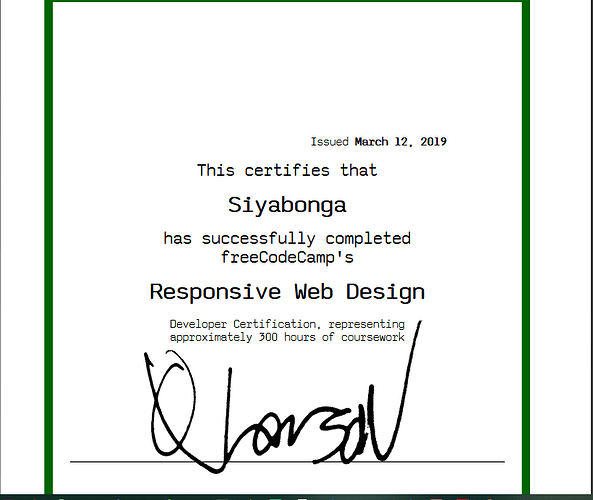 Congrats on claiming your Responsive Web Design certification! May it be the first of many! People have now spent more than 1 billion minutes using freeCodeCamp.